Tucson's modern history, as we know it, began hundreds of years ago, although humans have been continuously living in the Tucson-area for possibly 15,000 years. Hohokam, O'odham, Sobaipuri tribes lived throughout the Tucson basin for centuries. They roamed from the Santa Cruz River to the Canada del Oro to the Rillito Rivers depending on the seasons and available water. Even though they fought with neighboring tribes, when the Spanish first trekked through in the 1550s, they had no idea of the changes that would come from these outsiders visits and eventual conquest. Tucson in the 1600s remained relatively serene until the end of the century when a new wave of Spanish infiltration began with the journeys of Father Eusebio Kino. The Tucson of the 1700s was shaped by the effort of the Jesuits and the Spanish miitary to exploit mineral and human resources as they settled the Tucson valley. The Royal Spanish Presidio of San Augustin del Tucson was established on August 20, 1775. Each year, Los Decendientes del Presidio de Tucson, Los Cascarones, and other local organizations host events to celebrate Tucson's official birthdate in 1775. The annual Tucson birthday celebration is held the 3rd week of every August. This special event recognizes the five different flags that have flown over the city of Tucson since its founding in 1775. San Xavier mission plays a large role in the establishment of Tucson's long history. Other evidence proves humans have inhabited the Tucson area for tens of thousands of years. Tucson's other early mission- Mission Santa Catalina de Cuitakbagu. Somewhere near the the Cañada del Oro, north of Tucson, Arizona, there may have beem another early Jesuit mission called the “Mission of Santa Catalina (Catarina).” There is a legend of a lost mission in the Santa Catalina mountains that was destroyed by Apache Indians. The Santa Catalina Mountains have been experiencing a gold rush for hundreds of years. After the Gadsden Purchase, Americans began to flood the Southwest United States in search of gold, silver and copper. In the 1880s, numerous mining claims were staked throughout the Catalinas, many reclaiming old abandoned Spanish and Mexico diggings. Just below Mt. Lemmon lies one of the great stories of the search for gold in the mountains- the lost city and the lost Iron Door mine. As several missions were established in the valley near the Santa Cruz river, some reports included mining operations by the Jesuits deep inside of the Catalina Mountains. Explore the historical records that account for that thousands of pounds of gold, silver and gold-in-quartz that has been extracted from the Santa Catalina Mountains. Read about Tucson Arizona's Gold Rush. Discover the lost legends and history of the Santa Catalina Mountains. Explore the Santa Catalina Mountains. The Santa Catalina Mountains became valued for its copper and other precious metals in the late 1800s through the mid 1940s. This period of mining brought thousands of people to live and work throughout the Catalina Mountains from Mt. Lemmon to Oracle. Such notables as W.F. "Buffalo Bill" Cody owned extensive mining claims in the back hills. The Mine with the Iron Door is the legend of the lost Escalante mine that supposedly contains gold mined by the Pima Indians under the Jesuits occupancy. The Iron Door Mine was sealed up and its location is lost on history. But, the mine legend is still alive. Find out about more historical dates leading up to Tucson's establishment. As a special feature, we uncovered several out of print books about Tucson written at the beginning of the 1900's. These books are now in the public domain and can be read online or downloaded for free. Treasures of the Santa Catalina Mountains is one of the most comprehensive books written on the legends and history of the Catalina mountains, north of Tucson. Learn about the Iron Door mIne, Buffalo Bill Cody's mining interest in the Catalinas and how the lure of gold brought prospectors to the Cañada del Oro– the Canyon of Gold. The story of the the lost mine, the lost city and the lost mission. Download a free PDF sample of the book. Old Tucson; a hop, skip and jump history from 1539 Indian settlement to new and greater Tucson" by Estelle M. Buehman describes early Tucson history. She shares her accounts of the Old Pueblo when it was still a small town in the early 1911. Her book covewrs the history, dates and names of people who helped shape the emergence of Tucson. Read about the early pioneers, the establishment of schools, newspapers, churches, business and the lives of local Tucsonans in the 1800's in Buehman's "Old Tucson." Purchase from Amazon: Old Tucson; a hop, skip and jump history from 1539 Indian settlement to new and greater Tucson. This is an EXACT reproduction of a book published before 1923. "Tucson, Arizona" by Rochester Ford Issued by the Tucson, Arizona Chamber of Commerce and reprinted from "OUT WEST MAGAZINE" for September, 1902. Tucson lays claim to being one of the oldest settlements in the United States, ranking as to age next after San Augustine, Florida, and Santa Fe, New Mexico. Its history can be traced back to 1649, when a military station was established by the Spaniards to protect the Mission of San Xavier. Memoirs of Pimerîa Alta is Father Eusebio Francisco Kino's historical memoir of Pimerîa Alta. This is a contemporary account of the beginnings of Arizona, California and Sonora first published in 1919. It is out of copyright and can be freely downloaded as a PDF. These books are written by local author and publisher Robert Zucker. Entertaining Tucson Across the Decades is a collection of newspaper articles and original photographs covering 50 years of Tucson music and arts entertainment from 1950-1999. Read chapters and download a free PDF from the book. 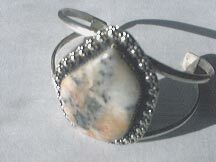 Ores and Jewelry from Mt. Lemmon. 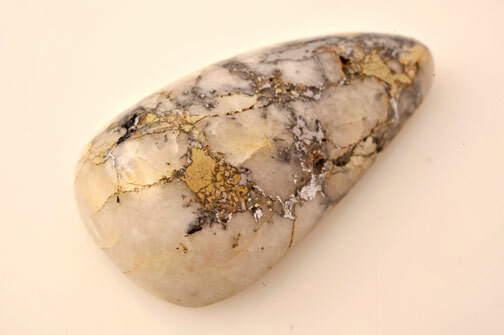 Extremely rare serpentine with white quartz, gold, silver and copper ores. From mines miles within Tucson's Mt. Lemmon Unique, one-of-a-kind specimens, southwestern artwork and fashioned jewelry by local artist Flint Carter. © 2011-2017. EMOL.org / Entertainment Magazine On Line. All rights reserved.